For decades, Americans have been looking to statistics for evidence of racial bias in the police force. And for decades, different statistics have been thrown around on both sides of the argument without an apparent victor. The most contentious point of the debate, and the most serious, is fatal shootings. Yet crucial statistics on police shootings were sorely missing. The Washington Post and The Guardian have now collected reports on fatal police shootings in the United States from the start of 2015 to July 20, 2016. Police shot and killed 1,523 people over the last 18-and-a-half months—990 people in 2015 and another 533 since the beginning of 2016, the Post found. The Guardian’s numbers account for an extra 29 fatal shootings in 2015 and, so far, 23 more in 2016, because they include some killings by off-duty police, the publication explained via a Facebook message. According to the Post, of the total 1,523 fatalities, 740 were white, 389 were black, 252 Latino, 61 of other races, and 81 of unknown race. While white people comprise about 77 percent of the population, they make up less than 50 percent of those shot dead by police. Black people make up a little over 13 percent of the nation, according to 2015 Census Bureau estimates, but account for over 25 percent of people shot dead by police. That means black people are about three times more likely to be shot by police than white people. On the other hand, black people were more than 3.5 times more likely to be arrested for a violent crime, based on 2014 FBI data that covers close to 80 percent of the population. Black people were also more than six times more likely to be arrested for homicide than white people. In some locales, these numbers paint an even more dramatic picture. In New York City, a black person was 15 times more likely to be arrested for homicide than a white person, based on 2015 data. In Chicago, black people were almost 28 times more likely to be arrested for murder than white people, based on 2011 data. St. Louis recorded 123 homicide suspects in 2014. One was white, 120 were black. The other two were Latino. These statistics have been extensively used to counter the accusations of racial bias. The argument is that black people run afoul of the law more often than white people and that’s why they’re getting shot dead by police more often. But the statistics are only based on police reports and omit accounts from victims and witnesses, thereby setting up the potential for skewing right from the start—these numbers don’t answer the question of whether police target blacks in the first place. Critics question the use of arrest statistics to gauge black people’s criminality. They argue that black people are arrested more often than white people for the same crimes. The most commonly cited example is the disparity in drug arrests. Black and white people use drugs at about the same rate, according to a 2013 Health Department survey. Yet black people are almost 2.5 times more likely to get arrested for drug-related charges than white people, based on the 2014 FBI data cited above. The problem is, surveys of drug use count on people telling the truth. Yet multiple studies found that people lie on such surveys, though the extent seems to differ from study to study. To complicate things more, black people are more than 3.5 times more likely than white people to be admitted to emergency rooms due to illicit drug use, based on 2011 Health Department survey of a nationally representative sample of 233 hospitals. That would suggest that even if black and white people tell the truth when surveyed, they end up using drugs differently. There may also be a difference in how white and black people usually sell drugs, according to Michael Tonry, professor of law at the University of Minnesota. Furthermore, as black people are getting arrested more often that white people for other crimes, it may be more likely that if they carry drugs, a police officer will find the contraband. A drug charge would then be slapped on top of whatever other charges they face. That doesn’t mean police officers are not racially biased in making drug arrests, but it makes it harder to prove such a bias exists using statistics alone. When it comes to arrests for other crimes, there is, again, a lack of data. For crimes with a victim, like an assault or robbery, we can check arrest rates against victim reports, based on FBI data. For example, if victims identified only 10 percent of robbers as black, but 20 percent of people arrested for robberies were black, it would suggest officers were more likely to go after black suspects. Yet the FBI 2013 data doesn’t show any such clear-cut differences. Victims identified about 21 percent of burglars as black and almost 30 percent arrested burglars were black. Burglary is the act of illegally entering a building with the intent to commit a crime within it. But victims identified almost 67 percent of robbers as black, while about 58 percent of arrested robbers were black. A robbery is defined as taking something from a person and using force, or the threat of force, to do it. However this particular set of FBI data covers less than 30 percent of the population and seems to lack data from larger police departments. The data may not be representative of the whole nation. Homicide arrest statistics may be harder to skew as it would require police to systematically arrest black people for killings committed by people of other races. When it comes to convictions, there have been 380 black people wrongfully convicted for homicide since 1989 and 296 white people, according to the National Registry of Exonerations. But, the statistics don’t say anything about the race of the actual culprit. The majority of police shootings occurred during violent crimes or robberies, at least based on data from 10 police departments, including Los Angeles, Dallas, and Houston, between 2000–2015. That would suggest black people are shot at by police more often at least partially because they’re more likely to commit violent crimes. The Post data showed another disparity—128 of the 1,523 people shot dead by police since the start of 2015 were unarmed. Of those, 50 were white and 50 black. That means almost 92 percent of the police shooting victims were armed, or thought to be armed. Usually, they had a “deadly weapon” such as a gun or a knife. For 57 victims, it turned out they only had a toy gun. For 55 victims, the type of weapon was marked as unknown by the Post. The researchers took 38 cases of unarmed black people shot dead by police in 2015 and used them to accuse all police nationwide of racial bias. If the population numbers are factored in, the data shows unarmed black people were almost six times more likely to be shot dead by police than unarmed white people. The gap got three times smaller when controlled for the age of the person shot, whether the person was mentally ill, whether the person was attacking a police officer, and for the crime rate in the neighborhood where the shooting happened, according to a report analyzing the Post’s 2015 data. In other words, the gap narrowed, but didn’t disappear. “Officers are perceiving a greater threat when encountered by unarmed black citizens,” Justin Nix, a criminal justice researcher at the University of Louisville and one of the report’s authors, told the Post. The problem is, the researchers took 38 cases of unarmed black people shot dead by police in 2015 and used them to accuse all police nationwide of racial bias. But most police departments in the country didn’t fatally shoot a single unarmed black person in 2015. In general, are police officers more likely to shoot at black people? On a national level, there seems to be no such data. Recently, Harvard economist Roland G. Fryer published a paper specifically analyzing police shootings for racial bias. Fryer asked 15 police departments for their records on shootings, including Los Angeles, New York City, Dallas, Houston, Boston, Austin, and Philadelphia. The others were smaller departments. All 15 departments were willing to participate, but in the end Fryer didn’t receive data from New York City, Philadelphia, and one smaller department. Fryer’s team of research assistants scoured the police reports for 65 factors. Was the suspect armed? With what weapon? Did the suspect attack the officers? Why were the officers called in the first place? Were the officers predominantly white, or black, or Hispanic? In many cases, the reports describing the circumstances of the shootings were over 50 pages long. After controlling for all the different circumstances, Fryer’s research concluded that officers were less likely to shoot at black people than at white people in similar situations. Fryer also looked for bias against unarmed suspects. He checked whether white officers were more likely than black officers to shoot at black unarmed suspects. They were not. In fact, the paper stated the only “statistically significant differences by race demonstrate that black officers are more likely to shoot unarmed whites,” compared to white officers. Fryer noted the data he obtained likely can’t represent the situation of the whole country. And the research only takes into account half of the story—the one reported by the police “who may have an incentive to distort the truth,” he said. Victims may have an incentive to distort the truth as well, but in this case their voices are missing altogether. Fryer did find evidence of racial bias, but somewhere else—in police officers’ use of non-lethal force. The New York City Police Department’s controversial stop-and-frisk policy saw police about 20 percent more likely to use force on a black person than on a white person in a similar situation, based on 2003–2013 data, Fryer found. The researchers controlled for a variety of circumstances, like level of criminality in the neighborhood, race of the officer, time of day, reason for the stop, and other factors. 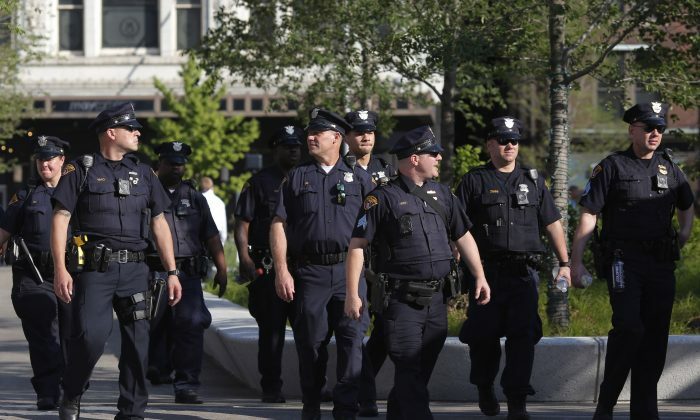 The results are limited to one, albeit large, police department, the NYPD. Yet, previous research looking at a dozen unnamed police departments presented similar results, though perhaps not as comprehensively controlled. Fryer said his results suggest “taste-based discrimination.” That is, police use force more often on black people when there’s little chance of repercussions. When it comes to shooting somebody, officers are more careful. Still, Fryer concluded that “we have no definitive proof of discrimination” just from looking at the shooting data and stop and frisk data because race can’t be assigned at random. Perhaps statistics alone can’t give us the ultimate answer after all.